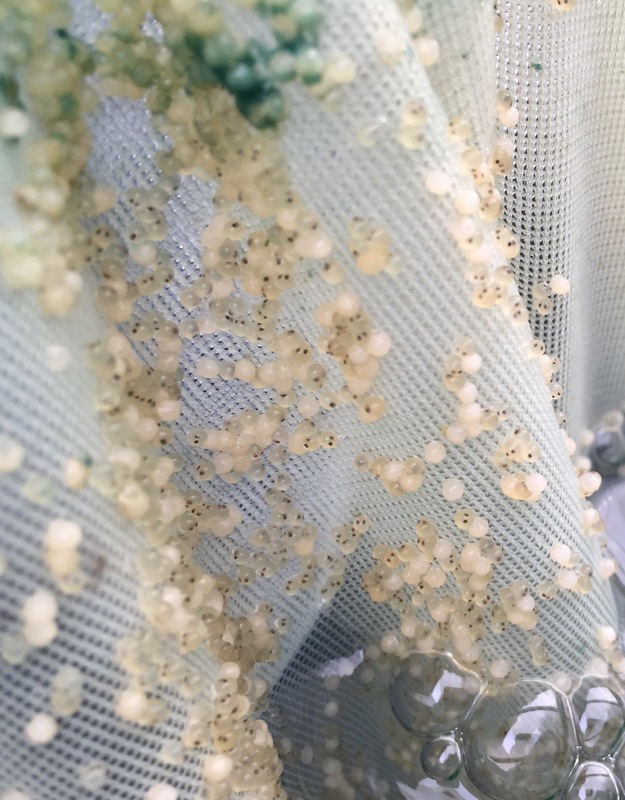 I assessed the fertilisation rate around 30 hours post spawning and estimated 50% of the eggs were fertilised. Since then, more and more eggs have turned white – ie, have gone bad. And, reviewing them last night (Tuesday night) , at the stage just before they are due to hatch – I’d say around 10% to 20% are still viable. I’ve seen a similar trend in both tanks that we are rearing the eggs in. Which suggests the root cause is not tank specific. So, it’s down to what happened to the eggs before I split them between tanks, or some other factor that affected both tanks simultaneously. I suspect either less eggs were properly fertilised or were not fully viable at the point of spawning. And/or, temperature fluctuations may have caused some problems. I’ve seen issues when temperatures shift quickly in the past – and this week, just one day after spawning the temperatures in the tanks went from 23 up to 27C in quick time. Over the years we’ve seen eggs going bad for various reasons, and sometimes it just doesn’t work! On the upside, we do seem to have some viable ones left and taking into account the modest number of eggs laid, and if we lose around half of those viable during the hatch – then hopefully there will still be a few thousand hatchlings for us to put out into the fry pond. If I was being optimistic, then at the most, we’ll have a little more than that but I’m not expecting more than 1 fry pond’s worth of hatchlings. So, we are looking to spawn our trusty okawa female to top up the hatchling numbers – and that spawning is planned for this weekend. I’ll run her with the usual dianichi males and together, this set has regularly performed well for us both in terms of number of fry and also in producing show prize winning koi. Having harvested around 60k fry from our early summer spawnings – I’m looking at the 100k fry target and being well over half way there – and knowing that I’ve now achieved over 40k fry to first selection twice; the 100k target feels in reach this year. It’s unlikely I’ll have such a successful early summer harvest again soon – so these mid summer spawnings could be my best chance for a while to reach my 100k target. I will need a reasonably successful spawning and rearing process to occur again this year for me to get close or even exceed the target. Lets see how the next few weeks pans out. This area of cage net has a higher ratio of eggs developing well, than have gone bad.